Vision: very nice, i like how the colors go well, like the peachness of the book and the pink and slight red of the rose and the text also makes the rose and book pop out. Technique:as i said it refers to the vision.. Personally I think this is a very beautiful piece of work you have here. I also think it shows beauty in reading. The colour of the rose is so pure and beautiful. I love the water drops on the rose, it's beautifully done. 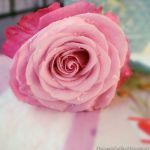 The pages are a slight peachy colour, which blend well with the colour of the rose. On the whole of vision, it is very nice. The colour cast is a pink / peach colour which make the photograph it's self look vintage. I love it! This has been done quite a few times but I must say you have done a good job at it. Some others I have seen aren't this good. Yours is really nice but originality is low, sorry. It is a lovely shot though. The technique is good. I love how you have made the rose the main focus by adding a blur to the book / writing. It is really nice. This picture was eye catching, it's really beautiful. It makes a good impact. Overall it's a really good piece, very beautiful. Keep it up!!! This is beyond beautiful! Just out standing! aw you are so welcome! they are all very nice !" The focus and colours are amazingly done in this photo! 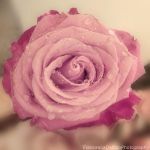 Beautiful photo with details like the blurring (focus) and water drops that keep my eyes on the rose. The color is amazing and your composition is terrific. Nice work!